Welcome to my blog. I am a passionate artist who also enjoys writing. I believe in living in harmony with the earth, each other, and sustaining the ways that bring peace and balance to our lives. 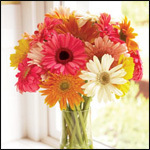 Gerbera Daisies (Gerbera Jamesonii) can in fact be grown as perennials indoors, flowering all year long. Caring for them as a houseplant not only livens up your home but purifies your indoor air of toxins. They are listed in the top 12 “Green” air cleaners by NASA. People are catching onto this fact, but they haven’t quite figured out how to grow them and care for them. You can purchase giant gerber daisies at your local garden center or you can buy them online. The other alternative is to purchase seeds and grow your own. Some people are successful at germinating the seeds of the gerbera daisy plants they bought. The seeds have a short shelf life so you will want fresh seeds wherever you get them. www.directgardening.com – A mixed array of colors. 1 plant for $3.50. 4 are only $10.50. www.springhillnursery.com – Choose from red, pink, white, orange, and yellow. 1 plant for $5.99. 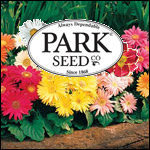 Park Seed Co. sells giant gerbera daisy seeds in a rainbow mix. 1 packet is $3.50. Click the ParkSeed banner at the left of this blog to go to their website. Making a purchase through that banner helps support me. For earliest flowering start the seeds indoors. The seeds have fuzz on one end. The thin ones can sometimes be infertile, so you want to look for the fat ones. When you plant them make sure to place the seeds vertically with the fuzz on top. Plant them directly in a shallow container with moist soil. Peat moss or peat moss pellets work well. You want them just under the soil line so that the little fuzz is almost poking out. They need light and warmth to germinate so place the pot in a warm sunny location that’s about 70 degrees. Germination takes around 15-20 days at 70 degrees. I recommend covering the pot with clear plastic wrap as this will keep the soil warm and moist. Always make sure the soil is moist when germinating. After the seeds sprout provide plenty of light and avoid excessive watering and drafts. When 4 leaves develop you can transplant them to larger pots. Gerbera roots are quite sensitive so you have to be gentle when handling them. If you want to grow them outside set the pots outside in a protected area to harden for 3 days. Then plant them in compost rich garden soil with plenty of sun and water them well initially. Adding some high energy fertilizer (high potassium) in with the water will help grow vibrant flowers. 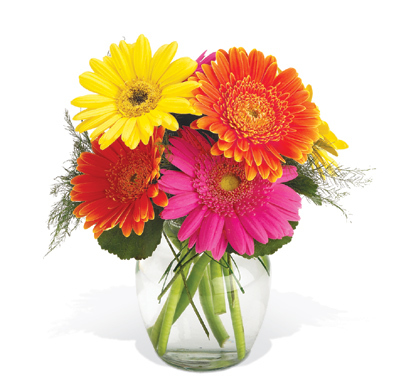 Gerbera daisies flower best when planted in 6 or more hours of direct sunlight each day. 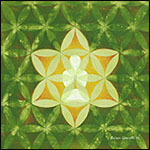 A high source of light can give an abundance of flowers. 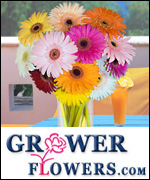 Gerber daisies need to be kept evenly moist but they should be allowed to dry slightly before watering. 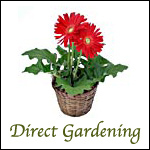 Gerber daisies require well-drained potting soil that is nutrient rich. In Mel Bartholomew’s book “All New Square Foot Gardening” he states that the very best soil for anything, plant or vegetable, is 1/3 compost, 1/3 peat moss, and 1/3 vermiculite. Healthy Gerberas are rarely ever bothered by pests, however fungus and stem rot is a common problem with over watered plants. You might want to remove old leaves regularly to prevent fungus infections. 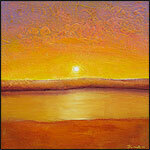 Creating abstract landscapes & spirited expression from the heart. 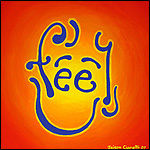 Contemporar Art Abstract Painting - Cianelli Studios official contemporary art blog for the latest events, news, and paintings. 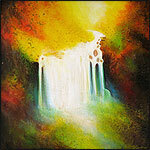 Abstract Art World - All Things Abstract Art. A Look at Modern Art & The Abstract Artist. Universal Truth Contest - With honesty, open minds, an open exchange of ideas, good will and the power of the Internet, we will find and spread the truth about life and death. Sacred Catalog - A community website providing a channel to discover the works and teachings of great masters to uplift the consciousness of humanity. Himalayan Salt Lamps - providing a wide variety of Natural Crystal Himalayan Salt Lamps, and other meditation related supplies. 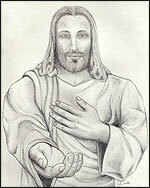 SelfGrowth.com - SelfGrowth.com is the most complete guide to informationabout Self Improvement, Personal Growth and Self Help on the Internet. It is designed to be an organized directory, with articles and references to thousands of other Web Sites on the World Wide Web. Wisdom Magazine - Wisdom is dedicated to opening people's hearts and minds to the philosophies, products and services of the new millennium. Wisdom Magazine is also one of the country's largest free holistic publications with 176,000 copies printed monthly in four regional print editions. 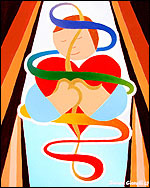 Expressive Arts - Holistic Junction is your source for Holistic Practitioners; Acupuncture, Chiropractic, Massage Therapy, Reflexology Schools; Alternative Healthcare; Insightful Literature and so much more! 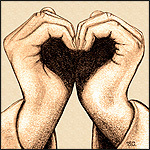 BlogCatalog Blog Directory - Home and garden blogs & much more. Connect your blog and get known. NESEED.COM - NESEED.com provides vegetable, flower, herb and organic bulk seed and seed packs for home gardeners and Commercial Farms and Greenhouses. We are proud to offer fresh exclusives, a brand new organic seed line and our popular selection of Italian Gourmet Seed. Request our Free Growers Seed Catalog for an easy reference when ordering seed online. Acupuncture Schools, Chiropractic Schools, Massage Schools - A comprehensive guide to Schools of Acupuncture, Chiropractic, Homeopathy, Massage Therapy, Naturopathy and Ayurveda. Enhanced Healing - Relaxation music, positive affirmations and online counseling for reducing stress and anxiety, promoting health, wellness and healing and improving self-esteem.